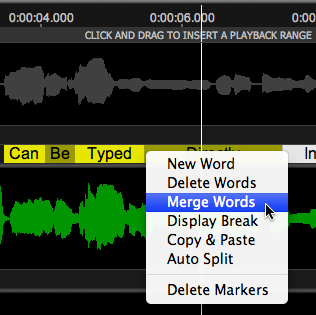 A "Marker Track" is a track below an Audio Track in Revoice Pro that can be loaded with user-defined moveable blocks of text. Each track can have any number of these Marker Tracks added. Uses for these include putting down words describing the sections of a musical composition (e.g. Verse 1, Chorus 2, etc. ), the words of a song in time with the audio, or the script of the dialogue for an ADR track in time with the actors corresponding words. 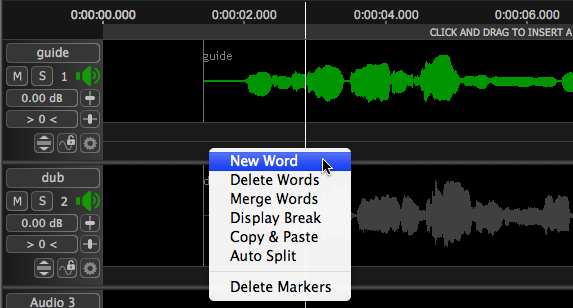 By RIGHT CLICKing an area in the Track Control panel, the above menu will appear, and if Add Markers is selected, the additional small track highlighted in red below will appear. By RIGHT CLICKing in this area, the following menu will appear. The next step is usually to bring up the same menu and select Auto Split. This will break each word into it's own moveable block as shown below. 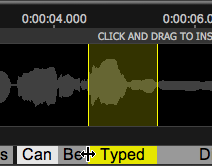 The selected block is shown in yellow and the edges of words can be dragged either direction to make the start and/or stop coincide with the related audio, as shown below. Similarly, if the cursor is a double headed arrow, then the boundary between two words can be adjusted by dragging. In addition, groups of words can be made with a SHIFT selection, as shown below. Additional operations in the menu can merge groups of words, Delete them, and copy and Paste into empty areas of sufficient length. 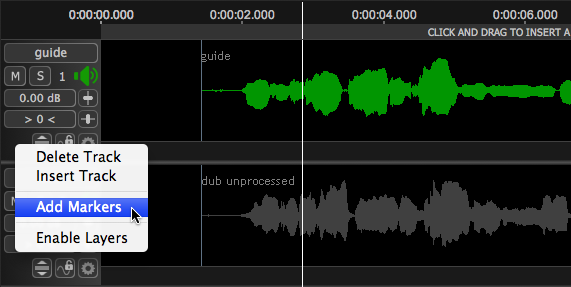 The purpose of these operations is to adjust the starts and/or ends of the words and blocks of words to provide visual cues as to the content of the audio throughout the track.